Our Sous Vide water balls are 100% BPA free, can minimize the effect of heat loss and water evaporation, lower energy waste,you will get what you want according to your recipe. You will never need to refill water as your Sous Vide will never run out of water at night. Now you can really set it and forget it. Go read a book, play with your kids, or enjoy uninterrupted sleep, without worrying about refilling the water! Food-gread material: 100% BPA free, made of food-safe material polyethylene, Sous Vide water balls with premium quality are more safer to ensure the healthy of your family by safe cooking process. It will help you save lots of time and effort! Help prevent heat loss: Sous Vide water balls are able to minimize the effect of heat loss and water evaporation, lower energy waste, you will get what you want according to your recipe. You will never need to refill water as your Sous Vide will never run out of water at night. Scientific and practical：compatible with Anova, Nomiku, Gourmia, Sansaire, PolyScience Sous Vide Controller and other professional sous vide cookers. Your Sous Vide balls will work excellent with any pot or container. Additionally, with water balls cover, the contents of your containers remains easily accessible all the while. 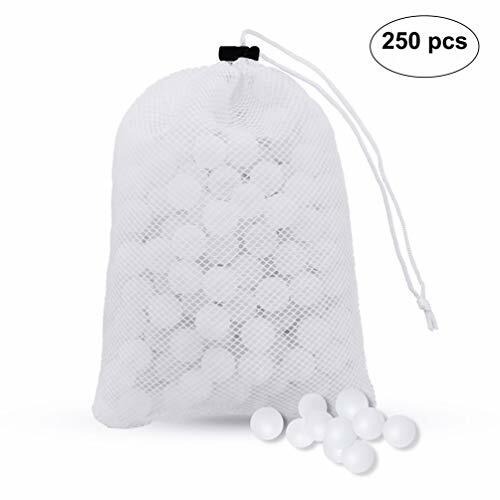 Handy Mesh Storage Bag ：come with a mesh drying bag and contains 250 balls, very convenient to dry and store, you could hang up the bag in somewhere after using ,easy to clean and dry which helps prevent bacteria and chemical corrosion. Satisfaction guarantee: If you are not completely satisfied with our products, please do feel free to contact us. We will give you a 100% refund within 90 days after the purchase. View More In Sous Vide Machines. If you have any questions about this product by Severino, contact us by completing and submitting the form below. If you are looking for a specif part number, please include it with your message.